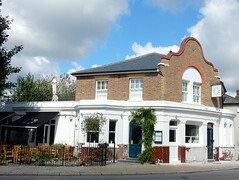 Pub in the St Margarets area of Twickenham. It was previously known as the Aleksander, but changed its name to the Alba in 2016. Inside, it's dim and low-ceilinged, with little natural light except at one table in the curve of a bay window. Decor is sparse, with exposed floorboards and sturdy wooden chairs and tables packed in tightly. The remains of a structural wall, now little more than a pillar flanked by two broad arches, separates this bar area from an even dimmer dining area, ready set with napkins and cutlery. A fairly substantial outdoor seating area is at the front, heated and partially covered. Kake visited on a Wednesday lunchtime in September 2015. I was the only customer when I arrived around noon. Music was playing, not too loud, and indeed only just audible over the ambient noise of the kitchen getting ready for lunch service and the traffic outside. Three of the five handpumps were on, offering Burning Sky Plateau, Oakham Ales Citra, and Timothy Taylor's Boltmaker. They also had keg taps for things including Kernel Pale Ale Citra Simcoe, Harpoon IPA, Burning Sky Saison Le Printemps, and Aspall Harry Sparrow cider. A pint of lime and soda was 1.20. They serve Italian food, including a regular menu photo and specials photo. Kake's linguine frutti di mare (£8 as a daytime special price; normally £14) photo was very good. There was a nice meatiness to the seafood, and a slight hint of chilli. The pasta was cooked just right, and the portion was a good size for lunch. Although the kitchen nominally opens at noon, a staff member explained that only pizzas were available initially, and the kitchen would open fully about half an hour later. Once the kitchen was open, they took my order at the table, and I paid afterwards at the bar. No service charge was added. According to their website as of August 2015, they have regular live music. Accessibility: A step to get in. Some of the seating in the bar area is at high tables. No steps to the toilets once you're in. Last visited by Kake, September 2015. Opening hours taken from the Alba website, June 2016. Last edited 2016-09-18 15:22:36 (version 5; diff). List all versions. Page last edited 2016-09-18 15:22:36 (version 5).